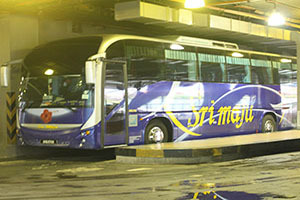 Sri Maju Express is one leading bus operator and one of the safest and most reliable coach companies in Malaysia with more than 100 units express coaches including Super VIP express coaches, executive double-deck and high-deck express buses. Sri Maju was founded since 1978, providing services along the west cost of Malaysia from Hatyai (Thailand), Perlis until to Singapore. Sri Maju Express (Kangar) is one of the Sri Maju agents for selling Sri Maju Tickets departing from the Northern of Peninsular Malaysia. 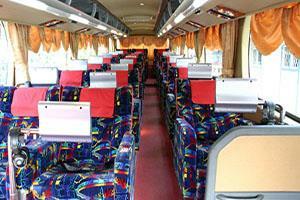 They offer comprehensive express bus service routes in Malaysia covering from Kuala Perlis (Jetty to Langkawi), Kangar, Alor Setar, Changloon, Jitra etc to Ipoh, Lumut, Kuala Lumpur, Shah Alam, Kajang, Klang, Melaka (Malacca), Seremban, Johor Bahru and Singapore. Sri Maju Express now has strong operation team and fleet of buses providing excellent express bus service to commuters on daily basis. Sri Maju Express (Kangar) is managed by a team of having experience of more than 10 years and gving their very best by providing their customers service of top quality. To further enhance their service and provide convenience to passengers, Sri Maju Express joins BusOnlineTicket to provide online booking service for their express bus. Mainly the route from Kangar to Kuala Lumpur, Kuala Perlis to Kuala Lumpur where Kuala Perlis is the Jetty that provides ferry service to/from Langkawi island.